Q: What is Microgrid Institute? A: Microgrid Institute is a collaborative organization that focuses on key issues affecting microgrids and distributed energy assets around the world. Our efforts address market development and analysis, regulatory and financial models, and project feasibility and structuring. Q: What are Microgrid Institute's goals? A: Our primary goals are: 1) to support development of markets for distributed energy solutions; and 2) to support development of microgrids and community energy projects directly. Q: Who are Microgrid Institute's principals and associates? A: See Our Team. Our principals and associates are foremost experts in their fields, including experienced attorneys, technology leaders, policy analysts, and researchers. Q: How is Microgrid Institute's work financed? Q: How is Microgrid Institute organized and managed? A: Microgrid Institute is an independent initiative of Burr Energy LLC, a limited liability company registered in the U.S. state of Minnesota. Microgrid Institute's operating charter is established by the Executive Director in consultation with the Microgrid Institute Advisory Board. Q: Is Microgrid Institute a government contractor? A: Yes, Burr Energy LLC dba Microgrid Institute is registered as a contractor contractor with SAM/United States General Services Administration, the U.S. Department of Energy, and the State of Minnesota. Q: Is Microgrid Institute a registered lobbyist? A: No, neither Microgrid Institute nor Burr Energy LLC engage in lobbying or advocacy activities. Q: What is Microgrid Institute's DUNS (Dun & Bradstreet) number? Q: Where does Microgrid Institute operate? Q: What is Microgrid Institute's mailing address? 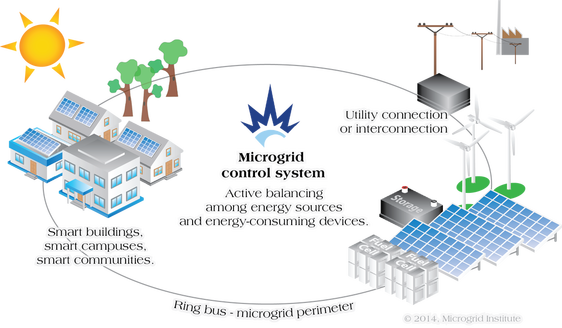 A: Microgrid Institute, 17501 Ginger Rd., Little Falls, Minnesota, 56345 U.S.A.
Q: What is a microgrid? Q: Does Microgrid Institute offer education or training programs? Q: Is Microgrid Institute an advocacy group? A: No, Microgrid Institute does not perform advocacy or government lobbying. Our goals and activities are intended to serve market development generally and microgrid projects specifically. We don't advocate for particular solutions or ownership structures. Q: Does Microgrid Institute offer microgrid equipment or services? A: Microgrid Institute provides a range of services, including development, finance, planning, and project management and contracting support. We do not sell equipment or technology products. Q: What does it mean to be a Microgrid Institute sponsor? Q: What is a Microgrid Institute donor? Q: How will Microgrid Institute use my contribution? A: Financial contributions are allocated to Microgrid Institute's general fund, to directly support all of our initiatives and operations. Donors are invited to direct their contributions toward specific initiatives or to dedicate donations to specific individuals or organizations. Q: Do we have to be a sponsor to collaborate with Microgrid Institute? A: Not necessarily. We collaborate routinely with a range of different organizations, companies, agencies, and individuals. Q: I have an idea, project, or invention related to microgrids. Would Microgrid Institute like to hear about it?